This January, we took a page from Japan and the Buddhist Zen philosophy as we start the New Year and plan to reach our goals. 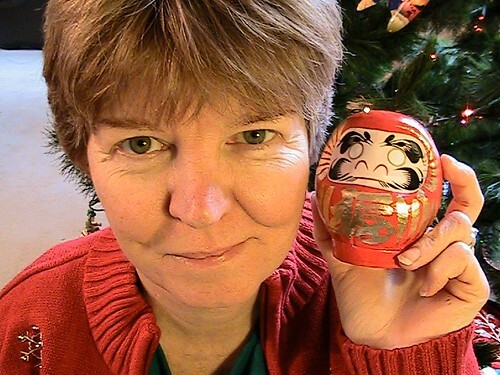 Our plan began in Honolulu, Hawaii with a Daruma doll. We went to Shirokiya to watch bakers from Japan make Usaguya dorayaki, small pancake-like cakes filled with sweet red bean paste. As the chefs cooked the pastries, they were packaged in pairs and sold. We shared an order of these gooey, filled confections. The pancake was light and fluffy while the warm filling was thick and creamy. Our Twitter friend, Yoshiko, tells us this is a very popular treat in Japan. Still hungry for more, we roamed the second floor of this Japanese department store where vendors sell traditional Japanese food. Each vendor section, about ten feet wide, is filled with their specialties. We wandered up and down the aisles selecting a variety of dishes and snacks that appealed to us. When we had purchased an assortment of foods from different vendor, we sat at the open area with other shoppers. We sampled tempura, sushi, salads, noodles, rice and mochi. While at Shirokiya, we purchased this Daruma doll. In Japan, Daruma dolls are given to others to bring good luck. In January, Daruma festivals are held all over Japan and you can purchase Daruma dolls in many sizes. Red is the most common color for these dolls through they also available painted in white, gold, purple, blue, green, pink, orange and white. These dolls are named for the sixth century Buddhist priest Dharma, the founder of Zen Buddhism. It is said that Dharma achieved enlightenment after sitting motionless in a cave for nine years. During this long meditation, he lost use of his arms and legs. Daruma dolls are often weighted in the base to keep them upright. When knocked over, they tumble before returning upright. This represents Dharma’s resilience and persistence in pursuing goals. Usually, the dolls are purchased with the eyes unpainted. When a goal or intention is set, one eye of the doll is painted. When the goal is complete, the second eye is painted and the dolls are saved as a keepsake or burned as offerings during ceremonies at temples. The “Where are You Today?” crew set our goals for this year and painted in the left eye on our Daruma doll. We wish you and your family a healthy and Happy New Year where you accomplish all your goals. Click on the picture below to watch as we set our goals and color our Daruma doll’s eye.